Elevation 350 to 1100 m. Temperature -10(15)...0°, wind 0...20 m/s. Heavy snowfalls, poor visibility for three days, including two half-days of blizzard. Trail: snowmobile tracks, deep unbroken powder below treeline and/or during snowfalls, packed snow above treeline and on lakes. This was my first multi-day skiing hike. I learned cross-country skiing as a child and had previously been on two solo winter hikes in Scotland, but those involved walking rather than skiing. My prime objective was thus to acquire some basic skills needed to survive in the Scandinavian mountains in winter and to estimate the appropriate equipment for future expeditions. Kunsgsleden is well marked and offers several evacuation options, making it a good place to test one's winter wings. In good weather, and walking hut-to-hut, this can be experienced as a kind of playground. Even so, winter weather is often unpredictable, and deep snow in combination with strong winds and whiteouts raises the difficulty level. Ye be warned. A note on the choice of skis. 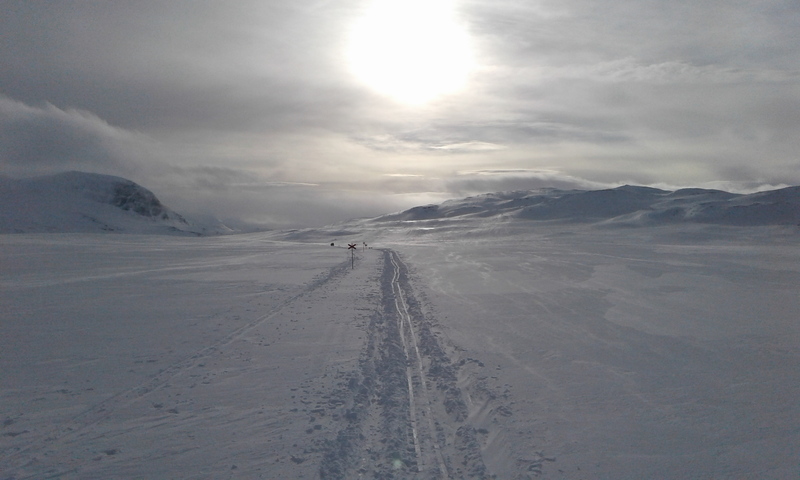 Normally, Kungsleden is well-trodden by skiers and, on sections with non-restricted scooter traffic, also by snowmobiles. Under these conditions, pretty much any skis will do, and you may even be able to skate. If you read Swedish, this is the most detailed first-hand report I've found: this guy skied the entire way from Abisko to Hemavan in just 7 days using very light equipment. (Observe: we are talking good weather and staying in huts.) If it snows heavily and/if you want to leave the trail, the snow below treeline is likely to be deep and powdery, making it impossible to walk without really broad skis with skins. Above treeline, it is usually so windy that the crust is hard, except during or immediately after a snowfall. So in a sense, high-elevation plateaus are easier than deep valleys. There are few steep sections on Kungsleden, but even relatively gentle descents can turn perilous if the path is icy and if you exceed the speed at which cross-country skis can be effectively controlled (disclosure: I broke my ribs and damaged a ski binding on one such descent). The impression I left with is that some form of telemark skis or sturdy back-country skis would be the most appropriate choice for this terrain. My bus arrived in Kvikkjokk precisely at sunset, and it was almost dark by the time I had reached the trailhead and repacked. However, it was a calm, cold, moonlit night, so I skied for a couple of hours before camping in the woods. The trail climbs steadily from Kvikkjokk, which lies in a river valley, but the stretch from Pårte to Aktse is almost completely flat. The perfect weather conditions next morning, with daytime temperature just below zero, no wind to speak of, and a well-used scooter trail, made skiing this stretch very enjoyable. On the other hand, camping in the deep fluffy snow below treeline is complicated business. The big advantage, especially with a tarp, is that trees can be used as anchor points for guylines, and that even the stunted birchtrees offer some protection from the wind. The disadvantage compared to high, wind-swept plateaus is that the snow is extremely deep and soft, making it very hard to break trail. You also have to trample down a platform for the camp, but even so my legs sank hopelessly as soon as I took off the skis. An old scooter trail leading up the famous Rapadalen and into Sarek, making me nostalgic about my wonderful time there in the summer of 2015. It didn't take me long to realize that it would be a whole new ball game to venture off the beaten track and into true winter wilderness, requiring broad skis with skins at the very least. So I stuck to Kungsleden and saved Sarek for later winter trips. The route is very well-marked, with red poles every 50 m and large crosses at turns and intersections. This seems superfluous in good visibility, but these poles really grow on you as the fog descends. Saltoluokta is a large, busy mountain lodge with a lot of tourists and scooters. There is a marked winter route across Luleälven. The ice here is treacherous because of the dam in Vietas, so it's a good idea to stick to this route. Then there is a gap in Kungsleden, which continues in Vakkotavare 30 km down an asphalted road. Instead of catching a bus, I skied along the shoulder of this road to Vietas and from there followed first a minor unpaved road and then scooter trails around Stora Sjöfallet national park. It's not the most fascinating stretch until you leave Vietas well behind you and approach Stora Sjöfallet. But the narrow gorge leading to Teusajaure is quite picturesque, getting wilder and better the further you go. I was lucky enough to find a decent scooter trail, some running water, and even a conveniently located grove of birches to kip in. Seizing my chance to dry out my sleeping bag, as the sun warms up the air to 0°C in the tundra just east of Stora Sjöfallet. The downside of this balmy weather was that snow buildup on the skis was beginning to slow me down. The next morning the pass was covered with at least a meter of fresh, powdery snow, into which my narrow skis sank like two sticks. I couldn't even ski down the slope, not to mention the sorry state of my knees after the exertions of the day before. After a couple of problematic hours, however, it stopped snowing, and the unabating wind quickly started to form a crust. By lunchtime it was possible to ski normally, and I recovered some hopes of reaching Abisko in time to catch my train. A nice view of Abiskojaure. I camped just before entering Abisko national park, where pitching a tent (or tarp) is technically not allowed. So - up and down, and overall a very tough hike, largely due to my inexperience and inadequate skiing equipment. But it was educational, and the mountains in winter are too beautiful to abstain from. It takes some guts and a lot of knowledge, but it can be done. Andrey Anikin, 2017. No copyright on any content.